Home » water » Why Does the Ear Hurt with Cold Air or Cold Wind Exposure? Why Does the Ear Hurt with Cold Air or Cold Wind Exposure? Not uncommonly, some people complain about ear pain (or otalgia) that lasts about 15-60+ minutes after the ear gets exposed to cold air or wind. The pain always resolves after the ears warm up, even if nothing is done. The pain is typically described as sharp or an ache deep within the ear canal. However, the pain may radiate around the ear and even below the ear into the throat. Wearing ear plugs or ear muffs when in cold air prevents this pain from occurring. Such discomfort also occurs when the ear is exposed to cold water (cold water swimming or SCUBA). First of all, this cold air otalgia should be differentiated from ear pressure pain from barometric pressure changes induced by dramatic temperature differentials. If the ear pain is described more as "pressure," than you may be suffering from eustachian tube dysfunction. 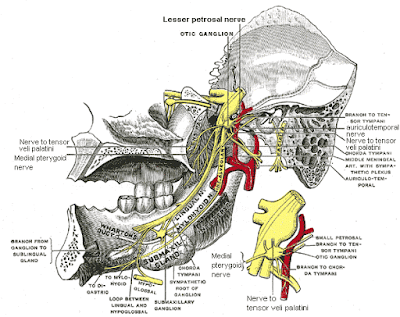 More info and treatment for eustachian tube dysfunction can be found here. However, if the ear pain does not have any pressure discomfort associated with it, the otalgia is almost certainly due to sensory nerve over-stimulation... analogous to "brain freeze" that may occur when eating cold ice cream. The skin of the ear canal is VERY thin without any fatty layer to insulate nerve endings from cold temperature stimulation. Also, there are numerous different nerve endings that innervate the ear and the ear canal, almost like that found in the solar plexus. • Cranial Nerve 7 (via Posterior Auricular Nerve): Pain mainly behind the ear. • Cranial Nerve 5 (via Auriculotemporal Nerve): Pain main in front of the ear. • Cranial Nerve 9 (via Jacobson's Nerve): Pain deep in the ear. • Cranial Nerve 10 (via Arnold's Nerve): Pain deep in the ear, but more in the ear canal. Over-stimulation of these nerve endings found in or around the ear from cold air exposure can cause pain. Once the cold air stimulation has stopped, the pain from the nerve over-stimulation will subside. Unfortunately, there is no cure for this condition. The best thing to do is prevent the ear from being exposed to cold air via use of ear plugs or ear muffs. Some individuals will be more prone to this than others, just like brain freeze from eating cold things. This is the best article I have read about ears being cold. Very helpful, describes exactly what occurs to me and although there is no cure, at least i know its not serious. Yes, good explanation. In the beginning I didn't understand what it was, but after the pain started I realized that I have been exposed to cold wind and lots of nerves have been affected. Mine isn't just caused by cold wind as in being out side. My right ear, sometimes both ears, can be affected by cooler temps in the house. If the temp is lower than 70°, my ear will ache. If I put something over my ear, such as a scarf, then it goes away. Ear plugs make my ear sore & hinders hearing. After being treated with antibiotics for over 5 years, for unseen ear infections and even ear mites of my outer ear, my GP at the time, finally decided it was Tri-menial Neuralgia and I was prescribed Carbamazapine. I was rubbish at taking pills and soon discovered that as the pain began to build, I felt that pressing on the Concha and the posteria auric sulcus, was what I needed to do, that in someway it felt that this would alleviate it. I would get a warning sensation in my ear prior to the pain beginning, at this point I was able to touch my ear and press on the concha and manipulate something in this area. It was like turning a switch off. In fact, I was able to turn the pain on and off at any time. Sadly recently I have not being getting the warning sensation and go straight to intense pain, so touching this area is impossible. The pain is also now lasting at least a few days, where as prior to finding this miraculous technique it would always have gone on waking the next day. The pain radiates from behind my ear and down my neck, but my whole ear is painful and also becomes quite red. Having managed this easily since my early 20's, as I reach nearly 50, I'm going to have to seek help from my GP. Or as my husband just said, take to wearing earmuffs on balmy spring and autumn days!